I am always impressed and a little jealous when I see travel hackers outline the way they organize their trips around the world. A recent example was this über-post on how to organize an international adventure. Tyler covers it all: From budgeting your trip and earning airline miles to hiring tour guides the smart way. The hacker’s tricks, discipline and organizational talent can certainly make travel classier (airline miles used for free upgrades, anyone?) and save you money. I’m a bit wary of the downsides of extreme travel hacking, though. The huge amount of planning it requires is a bit intimidating to me. Also, many travel hacking strategies require you to be based in the US and picking up several credit cards – deal breakers for me and many other people. The good news is that there is a double remedy at hand! Second, there is a way to travel that’s directed to dilettantes rather than hackers, and that has worked great for me for several years. It allows you to see the world instead of spending time in your planning room or on your airline’s hotline, it’s inexpensive – and all it really takes are the guts to leave your current home base for a while. Marketers would call it “The Anti-Hacker’s Guide to Seeing the World Without Stressing Out, Going Broke or Losing Your Mind.” I call it Hub Travel. Most travelers know travel hubs from their air journeys. A hub is an airport used by an airline as a transfer point to get passengers to their final destination. “It is part of a hub and spoke model, where travelers moving between airports not served by direct flights change planes en route to their destinations,” as Wikipedia states. For example, Atlanta is a huge hub for Delta Airlines, serving Delta travelers as a connection point to their intended destination.2 Panama City is Copa Airline’s hub to connect the two Americas. You get the idea. For long-term travelers, the hub approach can be taken to a whole new level. It is quite different from more organized ways of seeing the world: The classical tourist only travels for a very limited time and often has a strict schedule to keep. The backpacker moves slower, but still rarely stays at one place for longer than a couple of days, maybe weeks. As a hub traveler, in contrast, you become a (temporary) expat and move from your home to a place that intrigues you and that serves as a hub: You make this city your new headquarters – and use it as a stepping stone for exploring the broader region. Instead of over-organizing and preparing the whole trip from home, you just plan as you go, always with total peace of mind from the comforts of your temporary home. What’s more, travel will be inexpensive, as you are already in the region of your interest, say South East Asia or Western Europe. Thanks to this approach, I was able to not only see large parts of Colombia, but also to travel to Florida, the Yucatán Peninsula in Mexico, Guatemala, El Salvador, the Bay Islands of Honduras, the Orinoco and the Uairén in Venezuela, and the Brazilian Amazon department. In Europe, it was the hub approach that allowed me to visit friends and see places all over Germany, in the Netherlands, Belgium, England, Austria, Spain and France. The totality of these trips would have required either a huge amount of advance planning or quite a bit of money. Thanks to the hub approach, neither of the two was necessary! You don’t need to plan everything: If you want to leave your home for a longer time and organize a whole round the world trip, you will meet good old Mrs. Overwhelm rather sooner than later. The good thing about hub travel is that you go step by step: First, you leave and only research your hub – then you continue to plan and explore from there. It’s cheaper: Instead of paying expensive hotel rooms or living in ugly dormitories all the time, you just rent a place on your own. This lowers costs and improves standards. As it turns out, living in foreign countries often will be significantly cheaper than living at home: Friends of ours generally spend three to six months a year in Thailand and use it as a hub for South East Asia and Australia. As pensioners, they actually save money during their vacations – and they don’t even sublease their apartment! You find a new home: By living for a couple of months (or even years) at a completely new place, you make deeper connections with local people and culture, and experience the place in a much more profound way than most travel hackers ever could. If you take enough time, you might eventually call that once “new” place your second (or third, fourth, fifth, …) home. You learn a new language: Living at a foreign-language hub is the perfect opportunity to learn and practice a new tongue. Thus, you can not only skip travel hacking, but also language hacking: Immersing yourself with time in a new place will allow you to learn the language naturally, just like children would. Go at your own pace: From a tempo giusto perspective, the hub approach is the perfect way to travel. You don’t really know now where you want to be in three or six months, so why force yourself to plan it all down to the last detail? By living at a hub, you are free to react spontaneously to invitations, new discoveries, and follow your feeling, using the pace and the degree of organization that makes you feel good about it. We’re living in a 21st century world with 19th century nationalist attitudes. Thus, living in foreign countries (and, especially, living there for more than a couple of weeks) can still be tricky. That said, there are almost always workarounds, depending on your style and taste. Here in Colombia, as a EU or US citizen3 you can stay up to three months on a tourist visa that you get when entering the country. This visa can be extended for another three months. Depending on your negotiation skills and the person that attends you, you could extend it even longer, but it’s getting harder.4 In Thailand, people will do a visa run to the borders of Laos or Cambodia every three months in order to get a fresh stamp. In places like the EU or the USA, visa extensions are way more complicated. It really depends on where you are going. While visas are still easy to get for people who are lucky to have the citizenship of the “right” country,5 work permits are way more complicated. I personally wouldn’t care to dive that deep into bureaucracy, unless you have a company that backs you up. If you are self-employed and work remotely, you might be able to just stay on a tourist visa. As far as I can tell, there just doesn’t exist a visa category that is apt for location independent professionals (LIPs) yet. As LIP expert Lea Woodward points out, things change if you run a business that “caters to and sells to locals.” Be sure to keep this in mind – and do your research in order to avoid trouble. I’m a bad bargainer. Still, my outlook on things has changed a little since reading this awesome post over at Earl’s blog on how to save 40% on rent and still make a great deal for everybody involved. The major trick is to offer high flexibility to the landlord in exchange for a huge cutback on rent. While this probably won’t work everywhere, it’s certainly worth a try: By bargaining a little, we were just able to rent our beach house during high season here in Cartagena for 300 dollars instead of more than a 1000. As far as I am concerned, street food is great and should be part of a good travel experience. That said, if you stay at a place for a longer time, cooking for yourself will generally provide you with best quality for a fair price. Be sure to buy local groceries, even though they might look weird: Whenever I’m not sure what I’m about to buy, I just ask the vendor at the market place or a housewife in the supermarket what it’s good for, and give it a try. You will also find local cookbooks pretty much anywhere, often also in foreign languages. Courses directed by locals could be another option to avoid eating only the same stuff as back home. If you plan to visit India, you probably don’t want to go only during monsoon season. So if you plan to stay at your hub for less than a year, you might want to consider weather conditions before scheduling your voyage. Weather2Travel is a good resource for this. Another thing to keep in mind are important local events at your hub: You wouldn’t want to live in Rio de Janeiro for six months and miss the carnival because of unwittingly leaving two weeks early. Wikipedia or a simple Google search will easily inform you what events you should not miss. The flipside of the weather and event recommendation is that it might actually be likable to live at your hub off-season: The beaches are quieter, there are less salesmen around, travel around the area will be cheaper, as will be many apartments and restaurants. What’s more, the sights won’t be crowded, and it will be easier to get in touch with the locals. A good strategy thus might be to bring both season and off-season into your mix. For example, Cartagena would be a good place to stay from November to May: You get the independence festivities, the parties and cultural festivals during December and January, and then a lot more relaxed city during the coming hotter (but still dry and less mosquito-polluted) months from February onwards. Depending on your travel time and health requirements, it can either be cheaper to get a travel insurance at your home country or to buy one locally at your hub. Here in Colombia, the latter is much cheaper, but the quality is also inferior to the private clinics a travel insurance would cover. As I am (kinda) young and generally healthy,6 this is a good deal for me. Also, my German insurance is obligated by law to take me back as a client without any further inquiries once I move back to the country. Be sure to check these things before leaving. “But – only young and wealthy singles can do this,” is a common objection to the hub approach.7 I for one am (kinda!) young, but I’m also married and almost broke. Admittedly, I am rather flexible and have hobo blood running through my veins, but even if you are committed to your current place of residence, have a house and a family with children, the hub approach can work for you: A sabbatical year (or two), subletting your house, and organizing a college year abroad for your kids is really all it takes to get you started. Have in mind that the sublease you receive for your house in Europe or the US will often be (much) higher than the rent for your seafront apartment in Cartagena! Also consider that modern technology makes it easier than ever to keep up with your loved ones at home. You’ll be more comfortable bringing your expensive laptop if you follow the hub approach and rent a place rather than staying at shady hotels. Having your own place will also allow you to get a decent broadband connection and make you less dependent on slow wi-fi. There are a myriad of places that could serve as a hub, but some are better than others. To check if your dream destination allows interesting and inexpensive getaways, first of all take a close look at a map, and maybe at a travel guide of the area. Then, consult these huge lists of major airport hubs and low-cost airlines. The latter matters because low-cost carriers will offer you more flexibility and are very convenient whenever you travel with no or little luggage. As you can leave your stuff at your hub, this should generally be no problem. 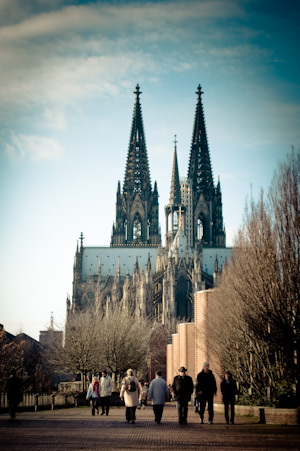 Cologne is the 4th-largest city of Germany, but with about a million inhabitants still fairly small. While Berlin certainly is the go-to place in my home country nowadays, Cologne has still a lot to offer: Bars, restaurants, a vivid concert scene, several interesting museums, the Dome and the old city, many parks and green zones, the carnival, and very friendly and open people. In the summer, you can enjoy barbecues in the parks; in the winter, you can just sit inside one of the cozy breweries and enjoy a Kölsch beer and some local food. As a hub, Cologne is perfect because of its large train station in the middle of the city and because of its airport that has been catering several low-cost airlines for a couple of years now. You reach it with a simple subway ride for 2,50 euros, and are ready to fly to pretty much anywhere in Europe for a couple of euros more. If you are adventurous, some airlines like Germanwings even offer “blind booking” at a very cheap price – you will only know your destination after the booking procedure. Cartagena has been my base of operations for two years now, but I know the city much longer. Like Cologne, it has about a million inhabitants – although it’s way more chaotic, as you might expect. Situated on the shores of the Caribbean, Cartagena is famous for its colonial city center that was declared a UNESCO World Heritage Site in 1984. The old houses and defense structures are beautiful sights, and as tourist streams begin to grow, several new restaurants have opened to offer more exotic dishes to well-paying foreigners. Bums like me still can find cheaper places, although it’s getting harder. Unfortunately, many of the normal citizens of the city can’t afford the growing luxury either, and thus the center is endangered to become just another tourist Disneyland. Future will show if the striving black culture manages to take back what is theirs, or if the foreign investors manage to sneak this pearl of the Caribbean. 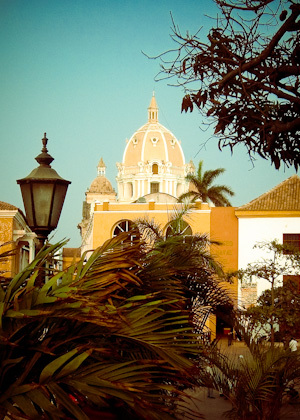 As a hub, Cartagena is beginning to be more and more interesting. Unlike many other countries in Latin America, most Colombian cities have one or two central bus stations, so whenever you go there, a huge selection of travel options is offered. From Cartagena, the beautiful beaches of Parque Tairona (near the city of Santa Marta) are easy to reach in a little more than four hours. A few hours more, and you pass the Guajira desert and reach the Venezuelan border. You could also head towards the Panamanian border in the West – or take a bus upcountry and explore the Andes. Cartagena’s airport is getting better each year. Nowadays, you can get flights to Bogotá for as little as $20, saving you what was a 20-hour bus ride with way too cold air conditioning! Flights to Florida and Panama can be found for $150 or so. Elevated at 2.600 meters or roughly 8.500 feet above sea level, Bogotá is a lot chillier than you’d expect from a city around these latitudes. Traffic jams, high pace and the overall vibe of a city of 8 million manage to heat things up pretty fast, though. Without a doubt, Bogotá is the cultural heartbeat of Colombia, featuring the greatest museums, restaurants, concerts and alternative culture in the country. The huge universities of the city are great places to start looking for what’s going on once you move there. In an article I wrote about Bogotá a couple of years ago, one of my favorite features of the city was its bus terminal and the possibility to leave – despite its advantages, the city is just a bit too large for my taste and starts to annoy me whenever I spend too much time there. As a hub, Bogotá is great because it features a very nice hinterland: Beautiful mountain villages can be reached easily within an hour or two by bus, and if you get bored by the climate, you can reach hotel resorts in tropical heat in the same time. As you might expect from the capital, there are also buses leaving to pretty much every city in the country. Bogotá’s El Dorado airport is too small, quite chaotic, and unfortunately still a little hard to reach if you’re not a pro user of the crazy bus system of the city. Things might get better soon: A new terminal is currently being constructed, aiming to convert El Dorado into the biggest and most modern airport of Latin America by 2014. Also, a connection to the bus rapid transit system Transmilenio is currently being created. Flight connections are decent. The military-run airline Satena leaves for almost every departmental capital of the country, and there are several competitors for the more popular routes. You can also book direct flights to Central America, the USA, Peru, Ecuador, Brazil and Venezuela, and connections to all over the continent. I want to reiterate this: Travel doesn’t have to be expensive. To get an idea, consult this list revealing budget travel costs in 94 cities around the world. But with so few things in life being perfect, hub travel probably isn’t one of them. I leave this to the hackers: Free flights would still be nice to have. So yes, I personally will definitely check out Chris Guillebeau’s Travel Hacking Cartel, and maybe you want to do the same. Considering the name, I hope you don’t have to smuggle cocaine in order to get the best airfare deals. I’ll keep you updated on how it goes! As should be clear by now, you will need more of it. Hub travel isn’t the way to organize a quick 6-week getaway with 18 pre-scheduled flights and bus rides. But this higher time commitment also allows you to travel naturally and enjoy the pace of the road – and for me, this is what travel really is about. When I went for my Orinoco/Amazon adventure in 2009, I just left when my Colombian visa was about to expire (I barely made it to the frontier on time), and then traveled as long as I felt right. About three months later, I arrived back in Bogotá, having bought my flight out of the jungle just a couple of hours earlier. Traveling like this can be a first step towards reaching time independence. You need to keep cool. There are some people who like to plan every single detail of their trip. Most of you, though, probably enjoy a good mix of planning and spontaneity on the road. As always, how you do it ultimately depends on your own preference: It’s your life, it’s your trip, and you decide how you want to live it! The title image is based on picture (CC-BY-SA) by Upon A Tree. Thanks a lot for this great work! Interesting take of traveling. I actually moved from Alaska to Las Vegas as my Hub, although I don’t think it’s technically a hub. Still, it’s a great starting point to travel from for me, and an amazing city to network in. I’ll check out the new site you linked to. What an incredible post, and an incredible approach to traveling, Fabian! I love this idea of having a new temporary home to branch out from, while still hitting a number of desired destinations. Great stuff, man. Just found your site this morning . . . and I’ll be back! Great post. A lot of long-term travelers I know are opting for this approach including Keith Savage at Traveling Savage. We will be doing some “hub” traveling in Europe, as well. This is a phenomenal post! I got it from my friend who just recently sold all his stuff and flew down to colombia with nothing but a bike and a tent. His return flight is in June and coming from Buenos Aires (you can check out his travel blog at http://benpennington.com). Do you have a more extensive list of hubs? Hey Jeff, Ben’s project is very cool; I hope to meet him in Bogotá! A list of hubs would probably get very long pretty fast – I would rather check cities of your interest for certain criteria: Size, the vibe and climate of it (depending on your taste), airports and airlines (and LCCs, as mentioned in the post), other transport opportunities, prices, and so on. Generally, the Wikipedia pages of the cities airports will indicate to which other places direct flights are available. Do you have any region that calls your interest? Do I have any regions that call my name? Heck yes!!! Mainly Central and South America. I’ve been studying Spanish very hard (45min-1hr/day 5 days a week) for several months now, and I want to put it to use. I’ve always been interested in Latin America, so it’s at the top of my interest chart. I am actually living some type of version of the life you have outlined above. I am an internet marketer and just recently got a to point where I decided enough is enough. I sold (or just plain threw out!) just about everything I owned, put a bit into storage, and gave up my place in Toronto. I am staying with a client right now in Phoenix, Arizona and do not have plans to go back any time soon, or at all. I will hub and spoke it out to San Diego and up to Oregon/Washington/BC over the next few months. I plan to keep Phoenix as my home base for a few months, then find a new one, who knows where. Thanks for making such a great resource here and articulating what I was haphazardly thinking! That’s awesome, Jeff! Makes me happy to see you’re living the dream! And considering Phoenix, I think you’re doing it right: Just enjoy your stay there, and at the same time, start exploring its hub capacities! 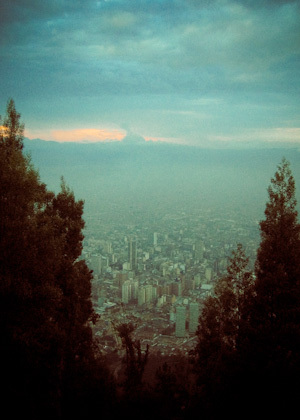 As for Hispanoamerica, why not follow your friend Ben’s path and give Bogotá/Colombia a try? If the capital is too chilly for you, Medellín could be another option, that’s actually very popular for tourists and expats. Cartagena is way hotter, and a much smaller city, but if you’re not all into action all the time, certainly worth a consideration as well! Then, there’s Central America, of course. Another great option because you can move so easily via bus and plane from country to country, and explore very different countries that are so close to each other. I like this idea! I’d never thought about having a second temporary home in a hub and using it to travel inexpensively around that region. Great post Fabian! this is an amazing post! i have been following your blog for a while now, and my new girlfriend has been on the road for 4 months…. travel on!!! Fabian, this post is the bomb! I love the idea of hub travel… But flights from Cartagena to Bogota for $20? Donde puedo encontrarlos? Do you know of some cheap airline I don’t know about? Bravo, Fabian-Bravo! For purely selfish reasons (hehe) this post was JUST what I needed and is the kind of thinking I should be directing my thoughts to. Since I made the decision to leave this year I have exerted a lot of unnecessary pressure on myself to race around and see the world in record time. Oddly enough-I’ve been looking into Cartagena this month as I want to improve my Spanish through immersion and I am a wimp in these Northern England winters :P It’s conveniently close to Cuba too! I’ve been there,and remember in Bogota it gets cold at night times,its beautiful there,the food is great also.You can visit the Casa de Nariño which is the presidents house,many tourists walk around there its beautiful. Have fun planning (and living!) your adventure, Kristen!